Prosource Protein Supplement Powder is the flavor-free way to add high quality protein to your diet. 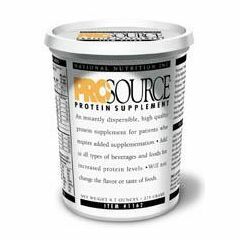 ProSource Protein Supplement Powder offers an instantly dispersible, high-protein supplement. It is flavorless and can be added to all types of foods and beverages. It is made from the highest quality whey protein concentrate and calcium caseinate. Each scoop contains 6 grams of protein. Smooth and easy-to-use. Unlike other protein powders, ProSource Protein Supplement is manufactured using an agglomeration process, so it disperses easily and evenly, without lumping, without settling out. Simply add the desired amount into liquid and stir briskly for 30 seconds for an evenly dispersed high protein drink that is so smooth, it's even ideal for tube feeding. When used in baked foods, ProSource Protein Supplement will not cook out or lose protein value. Ideal for use at bedside or for bulk feeding in the food service kitchen, ProSource Protein Supplement Powder makes high quality protein supplementation easier than ever. Simple To Take. Easy To Mix. Older People. During Illness. Dietary Replacement. Medical Professional. First Time User. place it in the oatmeal with brown sugar. Acts Quickly. Simple To Take. Produces Results. Good Taste. This is a great product to use with anyone who needs extra protein, but is particular about taste and won't use Ensure-type products. It is tasteless and mixes well with milkshakes, puddings, jello, or soup. I am a nurse, and my mother has M.S. We always fought pressure sores and I knew it was a lack of protein causing her problem. Since beginning Prosource, no more pressure sores! Easy To Mix. Shortens Recovery Time. How many calories per one-ounce serving?